Villa Dundar is a large imposing house in Kas, Big Pebble Beach area with Private Swimming Pool and best mediterranean Kas View owned by Dundar Family. Villa Dundar is split into 3 apartments and can be let as individual apartments. Top floor apartment sleep up to 4 people in 2 bedrooms (1 double, 1 twin bedrooms). The bed rooms are all air conditioned and has several balconies leading from them where you can relax and enjoy the beautiful panaromic sea views. There is a big table set for four people. It has a well equipped kitchen with dishwasher, cooker and large fridge freezer, living room with TV and there are 2 large bathrooms. It has hot water 24 hours. There is high speed WIFI available. The garden, pool and barbecue area are extensive enough for any number of people and the surrounding area has stunning views of mountains and crystal clear sea of Mediterranean. The villa is less than 10 minutes walk to the biggest beach of Kas. Your Home From Home Experience in Kas / Antalya / Turkey. We are also doing daily & overnight boat trips with our gulet and sailing yachts starting from Kas harbour. You can find reviews about us at tripadvisor by searching "boat trips by captain ergun"
Right across Kas, there is the Greek Island Nisos-Costellorizon . It is only 3 miles away from Kas. There are daily excursions by boats to Nisos-Costellorizon and also to another antique city of Lycian Civilization called the Kekova Island. 1km (50 miles) southeast of Fethiye; 229km (142 miles) southwest of Antalya; 25km (15 miles) east of Kalkan; 109km (68 miles) southeast of Dalaman Airport. Kas established itself as the more popular of the two in the 1960s and 1970s, first as a 'hippie' hangout and later, as another ideal stopping point for yachts and gulets on the Blue Voyage. The abundance of outdoorsy activities around Kas has also helped to maintain its reputation as a relaxed, satisfying, and generally inexpensive holiday place. Kas Restaurants: The food in Kas is just splendid. The good food alone will ensure you take back good memories of your Turkish holiday. Many of the Kas restaurants give you the best view of Kas from their terraces, and they make for great places to enjoy a drink while watching the sunset. The lights of the Greek island Meis at night and the sight of the marina are worth catching from the Kas restaurants terraces. Miles and miles of carpet shops, souvenir shops, and counterfeit sportswear have probably dulled your shopping instincts in Turkey, but Kas restores the pleasures of dallying among unexpected treasures, long forgotten after your departure from Istanbul. The old wooden houses along the side streets house wonderful little boutiques in a small-village atmosphere. But however great the selection of inventory may be, you can be sure to expect equally monumental markups. Pity the poor arrival with a keen desire for a souvenir during a limited stopover, and no bargaining acumen. Kas takes on the glow of numerous golden lights strung throughout numerous gardens and candlelight flickering from many of the town's nooks and crannies. A spot in the water pipe corner or next to the torch-lit sea wall at Pasabahcesi, Hastane Caddesi, is made dreamier thanks to the creative decor: garlic bunches and gourds dangle from fruit-filled lemon trees. I am Erdem, my brother Ergun (Captain Ergun on Tripadvisor :), my father Tevfik and my mother Gonul. I am working as a skipper at my sailing yacht at Kas Setur Marina. Doing daily / overnight sailing yacht tours around Kas - Kekova area. My father is retired Rose oil factory manager and mother is retired primary school teacher and my brother is doen BA in labor economics and industrial relations My brother is in charge of our gulet wooden yacht in Kas harbour in the summers. Me and my brother are able to communicate in English and you can ask us anything about Kas, Villa Dundar and boat trips in Kas region. We look forward to meeting you everyone who has chosen to stay at Villa Dundar and our personal approach will add a special spark to your holiday in Kas. Villa Dundar has breath taking views of the unspoiled town, the crystal clear sea and Taurus Mountains in Big Pebble Beach area. The views from the living room and balcony is the unique benefits. Watching the sunset is unforgetable. Thee apartment has 2 bathrooms for your party's use. It has hot water 24 hours. Bathroom towels, hand towels and soaps are supplied. There are hair drier in each bathroom. There are 2 bedrooms, sleeping 4 people. There's a good range of cooking facilities - gas rings, oven, grill, fridge, freezer, washing machine, dishwasher, barbecue - and adequate equipment. And every bedroom has airconditioning. Smoking inside the villa is not allowed. You can smoke at the balcony or in the garden. 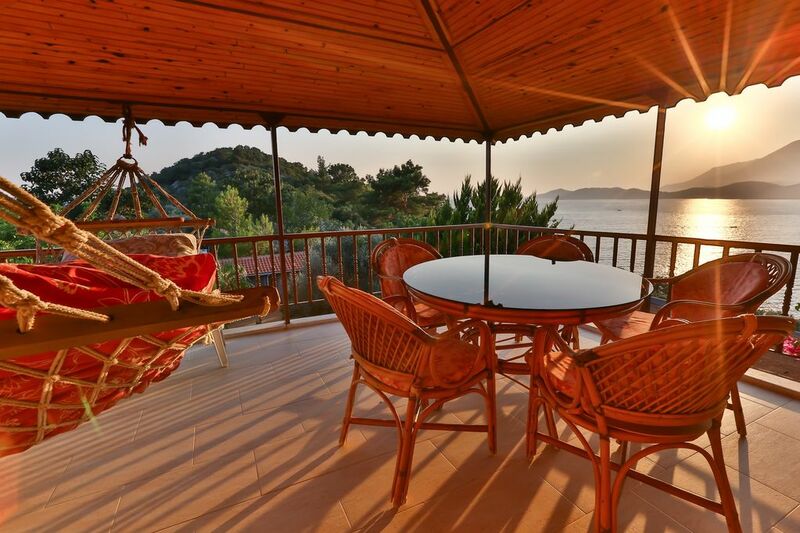 Villa Dundar is located at Big Pebble Beach area in KAS - ANTALYA - TURKEY. Beach is only 5 minutes walk. There are many restaurants at the beach. There are many places to visit from Kas. . You can visit Xanthos - Saklikent Gorge Canyon - Myra - St. Nicholas Church - Patara Beach - Kekova Sunken city - Kaputas beach - Boat trips to many different places etc. The closest airport is Dalaman. British Airlines now flies direct to Dalaman from major UK airports. Many airlines operate direct charter flights to Dalaman such as Excel Aiways, Monarch and Thomas Cook. Alternatively, fly to Antalya International Airport. All you have to do is to telling us your flights details and let us organize the rest for you. We can take you from Antalya or Dalaman Airport and bring to Villa Dundar confortably with our Wolkswagen Transporter minibus.